Concrete sample taken from the wall of an alpine road tunnel. The imaging was performed by laser ablation in combination with inductively coupled plasma mass spectrometry (LA-ICP-MS). 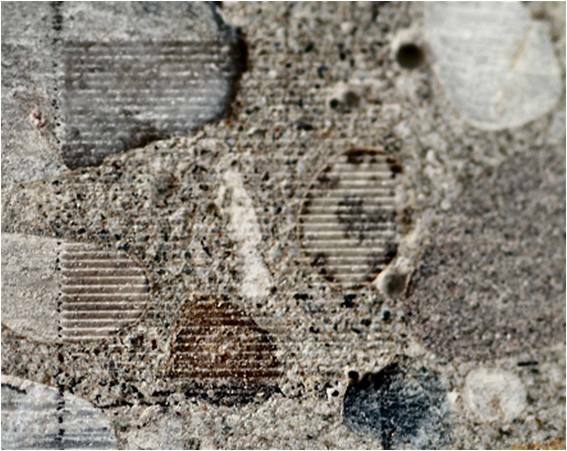 Top: photo of the concrete after analysis. The lines created by the ablation laser are clearly visible. Bottom: Three elemental images showing the distribution of magnesium, chlorine, and uranium. Data and photo courtesy A. Limbeck, Vienna Univ. of Technology.